So I had some friends over for dinner the other night. They are notorious wine snobs, you know the type. They are very nice people, and I like them a lot. But they don’t drink beer, unless you count Corona, and I don’t. Well, I took it as a personal challenge to help them to see beer in a new light. So I went into my beer cellar and brought out the big gun, The Stoic. Now, if you’ve had this one before then you know exactly where I’m headed with this. If you haven’t had it, seek it out and find it. My wine snob friends scoff at IPAs because they are too bitter. They avoid porters and stouts because they are too dark, and therefore must have too many calories. By process of elimination, import lagers are the best beers, because squeezing lime into them makes them taste better, so they have that going for them. 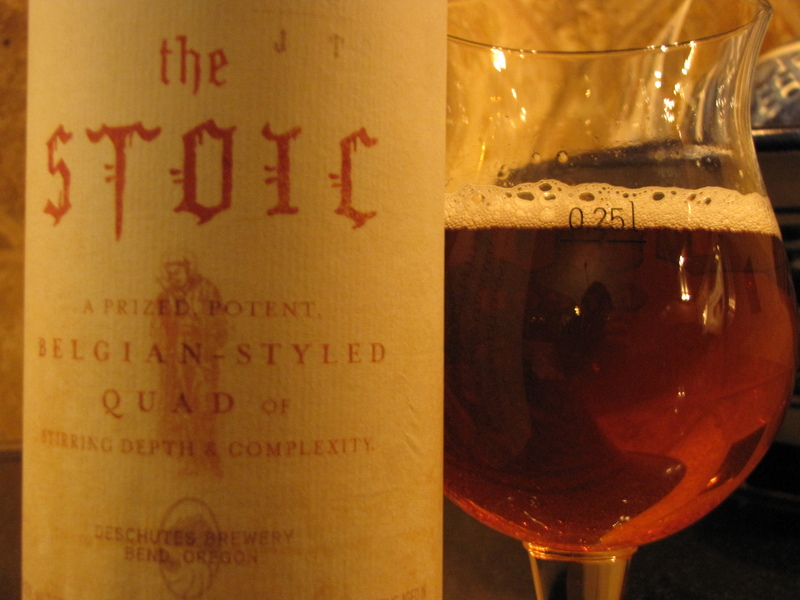 I appealed to their inner snob when I emerged from my man cave with the bottle of The Stoic. I asked them plainly, “Have you ever had a Belgian Ale? Well, I bet you’ve never had one quite like this.” I let them look over the bottle as I held it delicately, showing off the label by turning the bottle slowly while explaining that this was a “Quad”. Then I removed the wrap from around the top, popped the cap, and poured a small taste into a tulip glass for each of us while reading the details from the label. That got their attention. I first heard of Deschutes from their Imperial Stout of great fame, “The Abyss”. After searching for The Abyss and coming up empty again and again, I happened to pick up a bunch of their year-round beers in the process. I think these are excellent; Black Butte Porter, Mirror Pond Pale, Inversion IPA, Obsidian Stout, etc. However, their Reserve Series are simply fantastic. I’ve only had a chance to enjoy a couple so far, The Stoic and Black Butte XXI, and I am always on the lookout for The Abyss. Anyway, back to The Stoic. Next up was the first taste. We took our sips and I smiled as they sipped and swished it around and chewed the beer. It was fun to watch. I bet they never did that with their precious Corona and lime. They said it was tangy and sweet, with a spiciness they couldn’t quite place. I pointed out the woodiness from the barrel aging, and they said, “yeah, maybe that’s it?” This was complex and interesting enough that it held the attention of my wine snob friends. We all absolutely enjoyed it and were equally disappointed when we reached the bottom of the bottle so quickly. Unfortunately, I didn’t have another one to open. I guess that’s the problem with cellaring beers for myself versus cellaring beers to share. 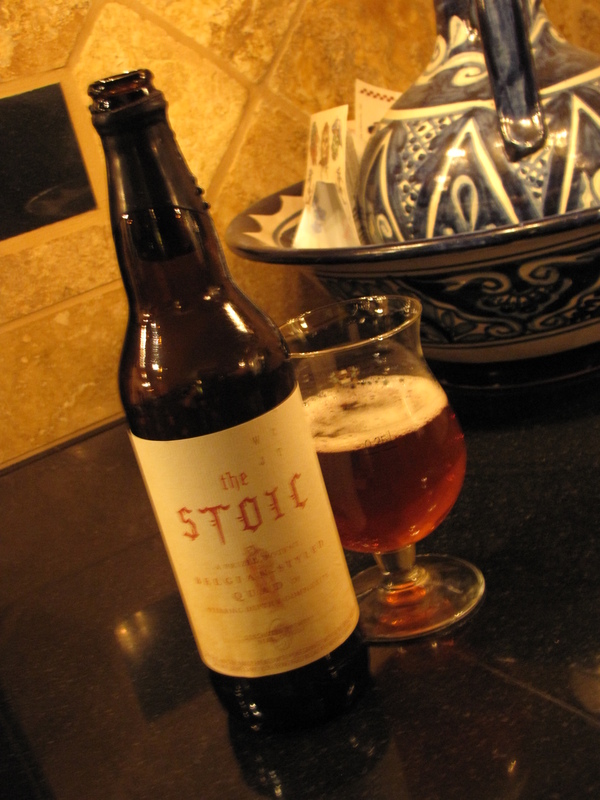 Looks like when I find the next batch of The Stoic available in stores, I’ll be buying a few bottles. I’m giving this one 5 beer soaked bottle caps because I think it helped me to convert a couple more folks to craft beer. It’s definitely one that I’ll buy again, and I’ll definitely buy it as a gift for my wine friends as long as they share it with me. 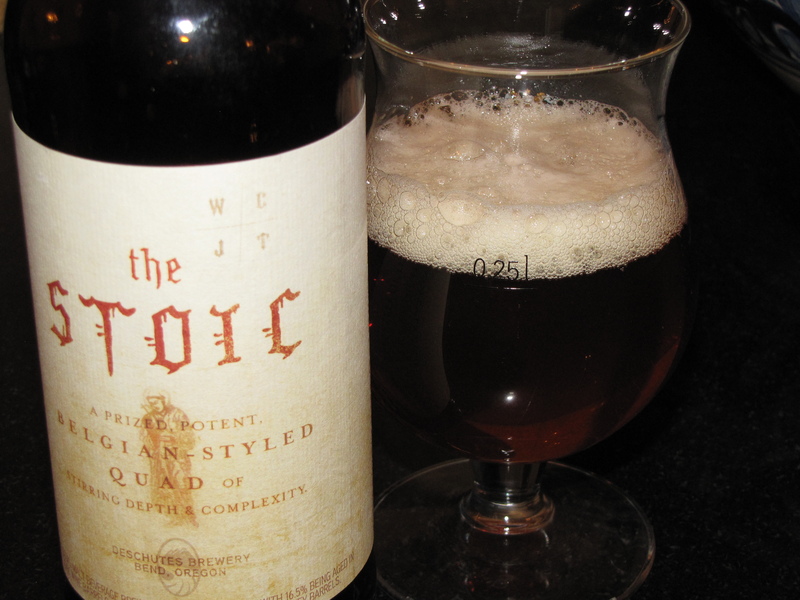 This entry was posted in Belgian, Quad and tagged 11%, 5 caps, Belgian, Deschutes, Quad, Stoic by Erik. Bookmark the permalink.